I remember buying this album in 1979 and the woman who sold me this album said, "Oh, you'll love this album. It is so much fun!" I had heard albums described in a number of ways, but "fun"? Well, turns out she was right. Bill Bruford, on his second album bearing his name, assembled himself with the best musicians around and recorded an album of prog-fusion that stands up to repeated listenings - even 21 years later. And it's still fun. The musicians on this album are Bill Bruford, drums and percussion; Jeff Berlin, bass and vocals; Allan Holdsworth, guitar; and Dave Stewart, keyboards. A short number that was a National Health number (Stewart was a member of that band and co-wrote the song with Alan Gowen). Steady, rapid drumming, sounding like someone pounding on a piece of sheet metal, opens the song, and then the main riff (played in 19/8! ), is played by Stewart. Holdsworth then comes in with a different melody before blasting off in an incredible solo. A funky passage follows as a bridge back to the main line that Stewart solos over. This short (2:20), yet always-moving number has a slightly dark underlying tone. A melodic line is played on what sounds to be a marimba. Then Holdsworth comes in with a solo over two verses. The guitar and marimba then repeat the melodic line. The song comes to a rather abrupt ending just when it appears to be building up to something. 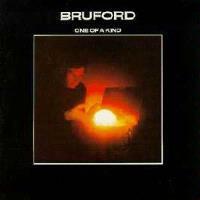 There is a bit of free-form exploring in the first forty seconds before Bruford lays in a 6/4 pattern, and the others fall in line. Holdsworth shows restraint before taking the lead, and even then his solo, while enough to make most guitarists drool in envy, never oversteps the rest of the band. The composition then goes back to the melodic line found in Part 1 of this tune. This song almost sounds as though Bruford wrote it with Annette Peacock in mind. (Peacock was featured on the previous album, "Feels Good To Me.") The first part of this piece is slow, jazzy, almost dreamy. Holdsworth fills in with nothing more than drifting chords throughout the first section. The number then speeds up a bit, and Jeff Berlin gets to solo. It then slows back to its original feel before speeding up again. Here Stewart gets to cut loose on keyboards. The piece fades in a mid-tempo pattern with a Holdsworth solo. This song starts with the only vocals on the album - a snippet of "Alice's Adventures in Wonderland" read by Sam Alder, Bruford, and Anthea Norman-Taylor. The band lays low for a bit, Holdsworth taking the lead. Then at 1:43, the main riff - an ascending scale over a repeating piano pattern - pushes the piece into the next level. Holdsworth plays a melodic line over this line. The composition then slows down for a change of pace, but that section gives away to a repeating keyboard riff. The band jumps back in with the main riff, which gives way for a Stewart piano solo. They then take the main melody line to maximum intensity before winding down to a quick ending. Berlin gets center stage with this piece that he co-wrote with Stewart and Bruford. The song starts with a rapid-fire riff, and then goes into a "chorus" with a guitar solo. This pattern is repeated, and then the it moves into a different direction. The chords slow down a bit, but that doesn't stop Holdsworth from tearing up the fretboard, and Bruford jazzes things up to keep things hopping. Written by Holdsworth, this tune shows Bruford at his most inventive drumming. Berlin takes the opening lead line before Holdsworth takes over on the chorus. The band then goes into a 13/8 pattern with Stewart flexing his chops. Holdsworth gets his solo in as well. The composition then slows down for a nice melodic line from the guitar, but later reverts back into its original mode. The first part of this song is quite beautiful and relaxed. It sounds as though a violin is taking the lead line. It then goes into double-time while keeping the same chord structure. Holdsworth gets a solo over this (with Berlin staying busy in the background), but the piece then reverts to its original tempo. This starts with ethereal keyboards, and a piano comes in with a hypnotic pattern. The piano then runs up an arpeggio, and the band kicks in, the piano keeping pace with 7/8 time with bass and drums following suit. Guitar then plays the lead line, followed by a bridge, and then a keyboard section that is the centerpiece of this suite. The keyboard plays one chord for one minute, and it is drawn out, run through effects to sound rather staccato, before dying out. The 7/8 riff comes back with Bruford playing along on marimba. The guitar melody returns, followed by the bridge, then everything comes swirling down to lead into Part 2. Co-written by Bruford and Eddie Jobson, this hand-clapper has the simplest structure of all the songs on the album. Somewhat reminiscent of Yes' "Wurm," this piece gives Holdsworth a chance to grab the spotlight for one last lengthy solo. The keyboards come in to build the song up, and then when the song reaches its peak, it comes to a quick end, and a deep keyboard chord ends it, but not before jumping a tone right at the very end.